Firstly I choose this handsome blue and white checkered Tristan Baby Boy's Shirt for Tyler Lee which is so stylish and one which is most definitely smart looking. I think the blue in this looks gorgeous with his eyes and the quality of the fabric is stunning, it has a very soft, smooth finish to it. This shirt is an all-rounder as the sleeves can be turned up to suit the summer months. The breast pocket is a lovely touch as is adorned with the red Joules hare logo. 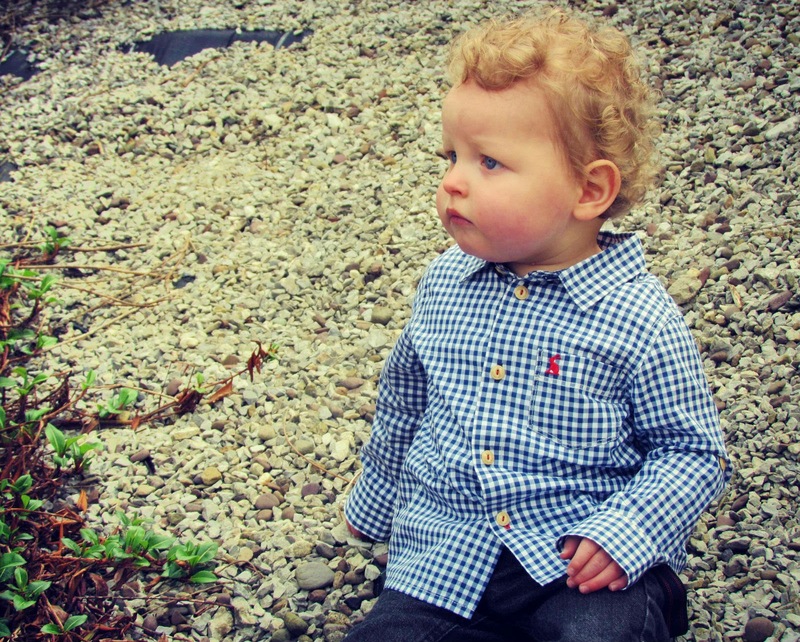 This shirt starts at £22.95 and goes up to 24 months. I also got Tyler Lee these adorable and very stylish pair of wellingtons which are his first. These are the Baby Boys Welly, London Print and I think they're fantastic. The blue colours are bright and vibrant and I love the pattern depicting quintessentially London type things. These wellies are great quality and will be perfect for Tyler Lee's muddy puddle jumping this coming autumn as I got them in a bigger size. These wellies are available in sizes 4 to 7 and are £19.9. For myself I picked up these beautiful floral print slippers with fleece lining. I was in need of a new pair and I thought these were beautiful for lounging around the house. These are so comfy and have great grip with the pink suede end on them. Unfortunately, these now seem to be out of stock but it isn't any wonder is it, they're stunning! I also got Tyler Lee these adorable Duncan Baby Boys Dungarees in the cream farm print, I just think these are absolutely gorgeous and perfect for the warm summer months due to them being short legged. These will look gorgeous with a little t-shirt underneath and sandals and with Tyler Lee's grandparents living on a farm he'll be right on trend whilst spending some summer days there wearing this. I literally can't wait to see him in this! These dungarees start at £22.95 and go up to 24 months. I've been looking for a long scarf for ages now and couldn't find one anywhere so I was delighted to see these beautiful floral print scarf amongst Joules' range. This is the Wensley Woven Scarf in Creme Posy. I have been wearing this scarf a lot, it really is a thing of beauty and is the perfect accessory for any outfit. I think the floral print is great for spring and summer attire too, it's so pretty and long enough to drape properly around the neck. This scarf is £19.95. I also got myself this beautiful Shirley Women's Tie Detail Blouse in Creme Horse print. This shirt has a fun horse and jockey print, quite appropriate for all the horse racing events going on at the moment! The fabric is crepe and very flowy, it's lovely. The shirt also has a dainty collar with bow detail and the back has gathered yoke detail in the center. All these touches make this blouse something special and really smart looking. This will be perfect with a pair of skinny jeans and heels. This blouse is now £34.95 reduced from £59.95. Finally, I got Tyler Lee this sweet Baby Farmhand Two Pack Trouser Set. The long sleeved top is an essential for spring and this one is very sweet with the Joules tractor motif. I love putting my boy in stripes so these red and white striped trousers are great for him to crawl around in and they're very comfy. I love the fact that this is a casual, comfortable outfit for him but it still has that smart looking charm to it too. This outfit starts at £26.95 and goes up to 24 months. I am really impressed with the quality of Joules clothing and fabrics, they have a sense of luxury to them and I love the styles and prints they have to offer, especially for boys. It's safe to say that Joules has become one of my favourite fashion brands and from the feedback I've gotten from friends of mine Joules pieces are firm favourites of theirs too so it really is a well loved brand. You can view these pieces and the other wonderful products Joules have to offer on the Joules website. Tyler Lee is such a little cutie! You've picked some lovely bits! A bit gutted my 27 month old is too big for the dungarees! omg the cutest wellingtons ever! And what pretty dungarees. I've heard so much about Joules brand and they do make beautiful clothing. fashion and beautiful! you have an angel!